Tire tread separation can be very frightening and dangerous, leading to a blowout and vehicle rollover. 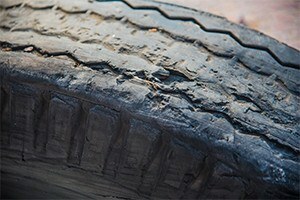 Often, drivers and passengers in vehicles with tire tread separation suffer serious injuries or even a wrongful death. Families of people killed in car crashes as a result of tire separation may not initially realize that a defective tire was to blame for the death of their loved one. When a defective tire is the cause of an accident, it may be possible to enlist a tire defect lawyer to hold the manufacturer of the tire or car responsible. At Moll Law Group, our auto defect lawyers represent people nationwide who have been injured as a result of tire tread separation. Tire tread separation may be the result of age, but it may also be caused by manufacturing or design defects in a tire. You may be able to sue the car or tire manufacturer, or any other party in the chain of distribution, for compensation if you are injured as a result of tread separation. Generally, to obtain compensation from an automobile manufacturer, you will need to show that the car has not been altered since purchase. Accordingly, in many cases, it is appropriate to sue the tire manufacturer rather than the car manufacturer. During ownership of a car, most owners do take their cars in for service and replacement parts. In some cases, it may be appropriate to sue a mechanic or retailer for compensation. Theories that a tire defect attorney may use to establish liability against a manufacturer or another party in the chain of distribution include strict liability, negligence, and breach of an express or implied warranty. Strict liability against manufacturers of defective products is permitted in many states, and it tends to be easier to establish than negligence. You will need to show that there was a manufacturing, design, or marketing defect in your tire and that the defect caused your injuries. In states where you need to establish negligence, you will need to show that the manufacturer owed you a duty of care, which it breached, resulting in the tire separation and the related injuries. Warranties are guarantees that a particular product works in the way it is supposed to work. When the warranty is in writing, and it is violated, resulting in an accident, it may be appropriate to sue for breach of express warranty. However, there are implied warranties that tires are good for their intended purpose in many states. If there is a violation of this implied warranty, it may be possible to recover compensation. Many defective tires have been recalled by tire manufacturers, including Firestone, Michelin, and Bridgestone. If you suspect that a defective tire caused your car accident, you should retain an attorney who can get a credible expert involved. The tire defect attorneys at Moll Law Group represent drivers and passengers throughout the U.S. who have been harmed as a result of tire tread separation. We are available to bring product liability lawsuits in states such as Texas, New York, Florida, Illinois, Michigan, Ohio, Pennsylvania, and California. Billions of dollars have been recovered in cases in which we have been involved. Call us at 312-462-1700 or use our online form to set up a free consultation with a car accident attorney.